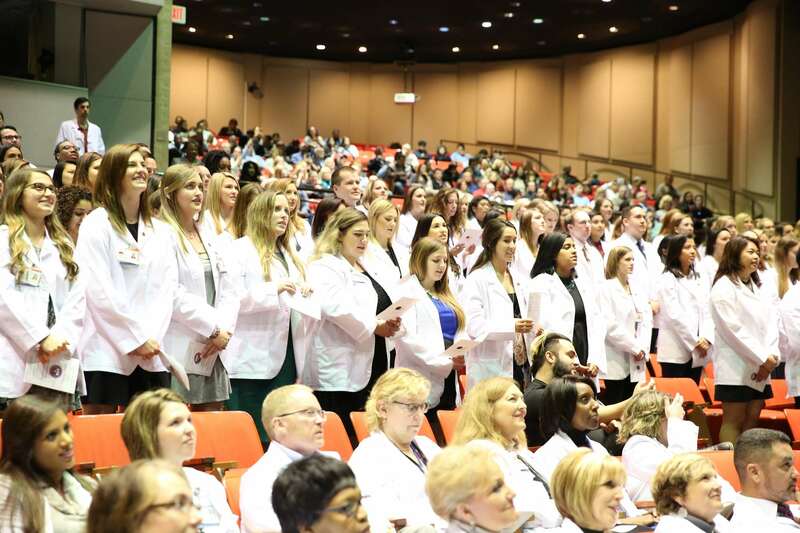 Intended for first year students in nursing, medical, and physician assistant programs, the White Coat Ceremony is a rite of passage that serves to welcome students to health care practice and elevate the value of humanism as the core of health care. It provides a powerful emphasis on compassion in combination with scientific excellence. The most important element of the ceremony is the oath that students take in front of family members, school leadership and their peers to acknowledge their central obligation of caring for the patient. First semester BSN students officially don their coat at the ceremony with the assistance of the Associate Dean for Undergraduate Programs and the BSN Traditional Program Director. Family members who are alumni of the UTMB SON are invited to participate with the cloaking. The Arnold P. Gold Foundation provides "Keeping Healthcare Human" lapel pins to students at all ceremonies. The pins serve as a visual reminder to students that in order to deliver the best care to their patients, compassion and empathy must be the hallmark of their clinical practice. Parking is available for guests in Parking Garage 2 located at 10th Street and Harborside Drive.